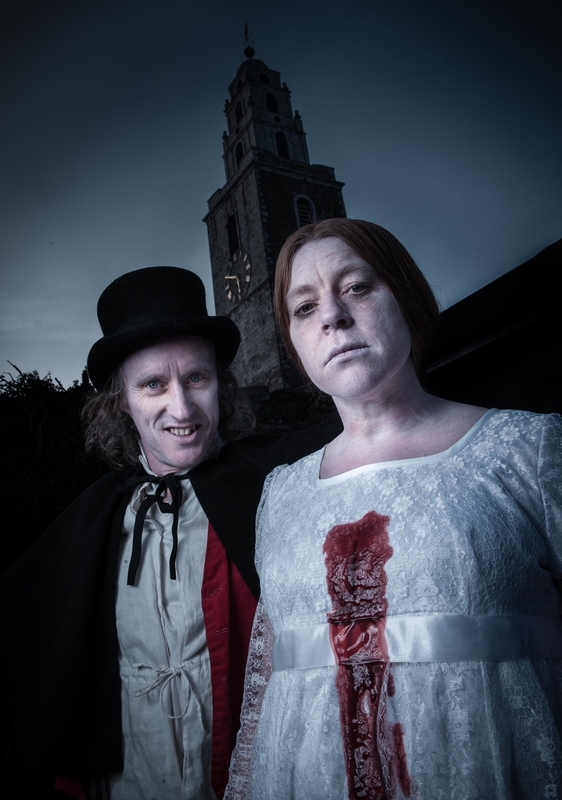 “Last Friday 29th of May we attended a Ghost Tour in Cork city for fun! The meeting point was at the Opera House in Cork and we had no expectations. None of us did something like this before. When we first saw a man, who was dressed up like from the 17. Century, we didn’t realise that he was belong to our group. Finally we found that the man with the pale face was our guide! Just as the tour started I was really impressed with the skills of the man. He turned out as a brilliant storyteller. Not only he has an impressive emphasis, he also told his legends with humour. Throughout the tour we visited a few famous buildings from Cork – of course a church (Shandon) and a graveyard. We stopped from time to time at the different points and he started to tell a new ghost story. He had also knowledge about the history from the town Cork and shared it with us. The man was helped a woman who make the story more lively. She was truly a terrific actress. She made the subtitle for the man and imitate the plot creepy. The woman went away from us, but never for long. Sometimes she came up suddenly behind the wall or behind a house and if nobody was frightened before, now they will be. Thanks to Alessia Schmid for providing us with the review of her weekend activities!